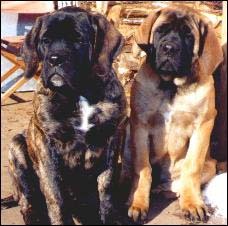 Old School Mastiffs began in 1974 when we purchased our first Mastiff, Ch. Hannibal of Makar. Since then, we have produced many champions, two Mastiff Club of America (M.C.O.A.) National Specialty Best of Breed winners, one M.C.O.A. National Specialty Best of Opposites winner, one M.C.O.A. National Specialty Best of Winners winner, and multiple M.C.O.A. National Specialty Award of Merit winners. We have also produced group placing Mastiffs and a Best in Show Mastiff. We are Mastiff Breeders located in central Virginia (near Richmond) and we attend dog shows in the surrounding area (VA, MD, NC). We are members of the Mastiff Club of America and the Chesapeake Mastiff Club. We are constantly striving to produce the best Mastiffs we can and we are especially interested in combining true Mastiff type with soundness. We firmly believe in the importance of pedigrees in a breeding program and this site is organized so that you can view dogs that appear several generations back in our pedigrees, as well as the dogs we have right now, and any current or planned litters. We breed infrequently, and only when we need to produce something to keep to continue our bloodline. Please check our Puppies page for information on available dogs and puppies, and on our planned breedings. Because we breed infrequently, we maintain a long waiting list for homes. We strongly prefer to place all puppies as companions on AKC Limited Registration. The navigation bar below will take you where you need to go.